White Rose store, first to 50! Collectible, stylish, quality and affordable. 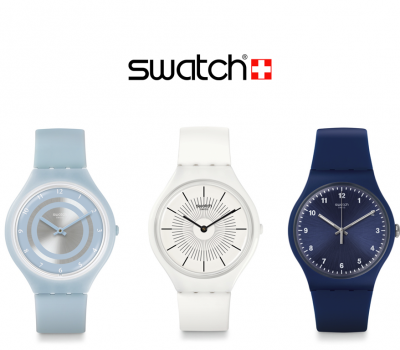 Words synonymous with Swatch, one of the most recognisable international brands not only in the watch industry. Since it’s creation in 1983, Swatch’s versatile designs have lead the way and changed the manner that people view their timepiece as a personal statement. We know our members of staff regularly go the extra mile for our customers and it's something we're incredibly proud of as a company. Away from the tweezers and technicians bench, our employee's also regularly go above and beyond in their efforts to give back to their communities and causes close to their hearts. We have a stylish rose gold plated classic gents model to giveaway to one lucky subscriber. The competition will be drawn on 12th June so just in time to give as a present (or keep all for yourself). The watch has kindly been provided by Accurist London. For those that don't know, Accurist have led the way in British designed watches for almost 70 years. Don't forget to include your watch in the spring clean checklist this year. With the strap covering up to 80% of the surface area of your time-piece, it is often underestimated the difference a new strap can make to the appearance. Whether wanting to simply freshen up a tired looking watch or looking to change the colour scheme of your favourite accessory, here at The Watch Hospital we have a comprehensive selection to meet your needs. Our premium offering in-store comes from Austrian based Hirsch bracelets, who have a long reputation for supplying the leading Swiss and German watch houses. "Owners of precious and distinctive watches will want their watch bracelets to be just as unique and special. HIRSCH bracelets for watches are masterpieces of craftsmanship. Each one is made individually in many production steps to add a precious and unique character to the overall appearance of the watch. Every HIRSCH bracelet is the tangible expression of our claim to make the bracelet the most beautiful outfit any watch can appear in. Our family enterprise, that I have the honour of managing in the eighth generation, is dedicated to the most advanced, detailed and finest bracelets in the world." Explains Robert Hirsch, CEO. Following the usual manic Christmas and sales period it was time for our annual manager's get together. Most of the nation may have been feeling good for been several weeks into the de-tox and having abstained from alcohol, those extra festive pounds had been shed and general health was optimistic. With this in mind to the delight or dismay of our staff and manager's, the venue for the meeting had been decided - a brewery tour. Congratulations to the winner of our Euro 2016 competition, Lisa Wilton from Sheffield who successfully selected Group F containing the winners Portugal. She visited our Meadowhall branch and was delighted to select an Ice Watch and also a Casio model. To be the first to know about our next giveaways or competition sign up to our E-Newsletter. As Father's day approaches it's time to gather some ideas for that perfect gift. We think it's the ideal time to show your appreciation for Dad by picking a present he will most certainly appreciate. We've cast our careful eyes over our collection of watches and have compiled 5 options that we feel would do the trick whatever your father's taste or lifestyle may be. To enjoy 10% from any of these models please use code 'fathersday' at the checkout. 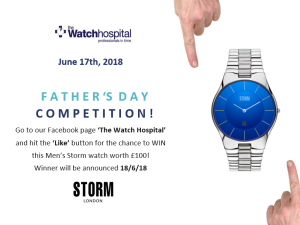 Win a watch of your choice up to the value of £150!! We're as excited as everyone for Euro 2016 coming around and a few people around the office are even daring to dream England might just go all the way this year. Chances are we will be nursing our wounds after another Quarter-Final penalty shootout upset, but we're not letting that dampen our moods. We're giving a free prize draw entry with EVERY watch purchased online or in-store. After your purchase simply let us know which Group you think the winner of the tournament will be from for a chance to win a watch of your choice up to the value of £150. i.e "Group A" will be your selection for either Albania, France, Switzerland or Romania to lift the trophy. The winner will be drawn after the final on 10th July. The watch industry may seem somewhat serious at times as us professionals in the trade are irrefutably passionate about the products that we work with. It is however refreshing to see that some watch brands and watchmakers took the time from their busy calendars to put down their wind up movements to be wind up merchants. At the Watch Hospital we’re also partial to good-natured fun so we thought we’d share our favourite gags from yesterday. A Fresh addition here at The Watch Hospital, in the shape of a military aircraft inspired range with detailing second to none. AVI-8 in their own words describe how their collection “seeks to honour both the aircraft and the untold story of the airmen who have dedicated themselves both in and out of the cockpit to bring these incredible machines to life”. We think that’s a mission they accomplish with flying colours. We're so pleased to launch our new website, we want to celebrate with you by offering a very special 10% discount on any purchase from our online watch store! Simply add the coupon code WATHOS15 at the checkout to receive your discount. For all the latest offers, information and support sign up to our newsletter. We won’t share your private information with anyone else.